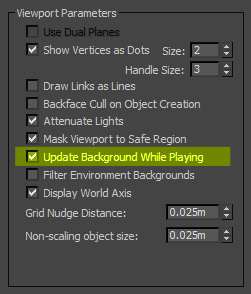 Update background while playing allows you to use animated background images in the viewport. When on, an IFL file, AVI file, or MOV file updates on each frame when you click the Play button. It can be a bit slow, so you may want to turn of turn off the real-time switch on the Time Configuration dialog.